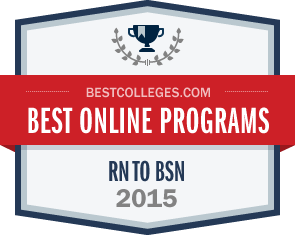 Stanbridge College has been ranked 15th in the nation for its online Bachelor of Science in Nursing (RN-BSN) Degree Completion program from Bestcolleges.com. Over 400 nursing programs in the United States were evaluated based on their admissions, retention, and graduation rates using the latest information from the US Department of Education Integrated Postsecondary Education Data System (IPEDS) and College Navigator databases. Stanbridge College is ranked 15th in the nation for its online Bachelor or Science in Nursing Degree Completion program. In light of the increasing desire for hospitals to achieve prestigious Magnet status – in which an organization is recognized by the American Nurses Credentialing Center (ANCC) for demonstrating excellence in patient care – 75% of nurse managers in the organization must hold a bachelor’s of science in nursing (BSN) or graduate degree in nursing. Reaching this designation requires a deep commitment to patient care, and proves the demand for highly skilled nurses in the workforce is greater than ever. With accreditation from the Commission on Collegiate Nursing Education (CCNE), the RN to BSN Degree Completion program at Stanbridge College offers a pathway for registered nurses with an Associate of Science in Nursing to complete their bachelor’s degree in 21 months. The program emphasizes enrichment threads in Pathopharmacology, Evidenced-Based Practice, and Healthcare Informatics. The College also offers a Master of Science in Nursing matriculation pathway for students to pursue their master’s in a fully online degree program. The Master of Science in Nursing at Stanbridge College offers specializations in either academic or administrative tracks. Both nursing degree programs are hosted through the award-winning, Edverum™ online learning platform, exclusive to Stanbridge College students. For more information, contact Stanbridge College at (888) 538-4913 or www.stanbridge.edu.